We are absolutely thrilled to be presenting a new large scale outdoor installation with Sunday Drive Art Projects. Join us on opening night as Akin Collective brings contemporary art to the small town of Warkworth, Ontario for this 16 day festival alongside Mercer Union, InterAccess, FADO Performance Art Centre, The Gladstone Hotel and many others from August 23- September 7. Take the Sunday Drive Express with Akin Collective - It's an easy way to get to the show and back and have a load of fun doing it. The Sunday Drive Express will leave Toronto's west end near Lansdowne subway station, from 87 Wade Avenue, at 4pm and return by midnight. $25 gets you a ride there and back for the opening party on August 23rd and includes beer, snacks and artistic surprises. If you do the math it all adds up to the best Saturday night you've had in a long time and a great deal. Save 20%! Get discounted tickets by entering the code SUNDAYFRIEND when making your purchase. 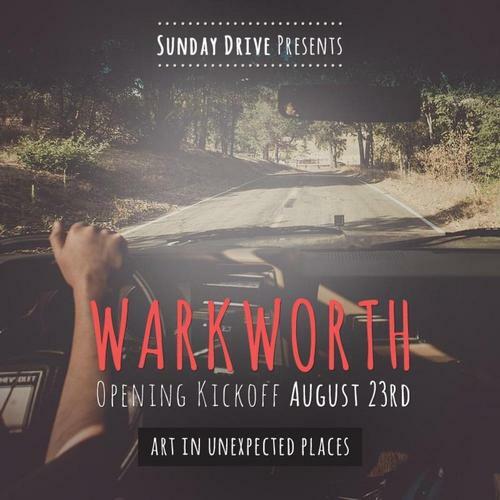 Warkworth is a quaint, beautiful, inspiring little town about 1.5 hours outside of Toronto that will be transformed by the work of artists chosen by artist run centres, collectives and alternative exhibitors that you'd never normally see outside of the city.